Several mathematical models take into account physical phenomena on different scales. The numerical methods have to deal with the smallest scale which renders prohibitive the simulation prohibitively costly, or even impossible. Besides, many real-life problems are also rife with sources of uncertainties (due to experimental data for instance), and it becomes particularly important to consider these uncertainties in the simulations. Another interesting point consists in preserving at the discrete level some properties of the mathematical model, such as the invariants or the symplectic character of the solution. Several works have been done in this direction to design and analyse efficient numerical methods for ordinary differential equations (ODE). However, the transfer to partial differential equation (PDE) is still incomplete. 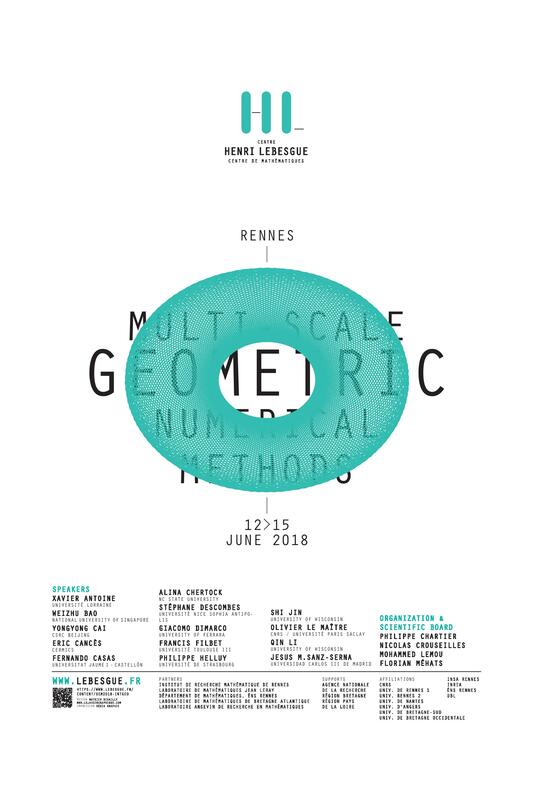 This workshop is an opportunity to gather researchers of different communities (geometric or multiscale numerical methods, uncertainty quantification, ...) to ease collaborations at the border of the domains. The workshop will take place at the Inria Rennes-Bretagne Atlantique center.